Join us for a journey into centuries past, as we traverse the route used by the first humans to set foot in the Americas. Nearly 11,000 years ago, the Pericue Indians trekked down the Pacific Coast Migration Route, through the canyons of the Sierra La Laguna, eventually settling in the Los Cabos area of Baja California Sur. The Pericue inhabited these lands for thousands of years, until European disease is thought to have rendered them extinct in the 18th Century. Today, the lands of El Cayuco Canyon are home to fascinating petroglyphs, carved and painted by the Pericue thousands of years ago. By witnessing these drawings, we can get an idea of what life was like for these ancient people, millennia before the missionaries arrived in the Baja. 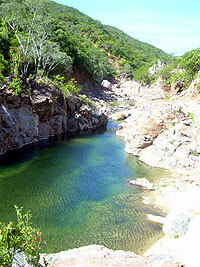 It is easy to realize why the Pericue chose the canyons of the Sierra La Laguna to make their home - the increased rainfall of this area stands at stark contrast to the desert climate that surrounds it. Inside this desert oasis, flora and fauna thrive, subtropical birds sing, and beautiful waterfalls cascade over the canyon walls. We'll begin our hike at a real Sudcalifornia ranch, where your expert guide will give you a safety briefing before setting off through El Cayuco Canyon. We'll hike through the canyon, along the river, where fresh water flows over huge granite boulders, to a waterfall that cascades into a pool. Here we'll cool off with a swim - incredibly refreshing on a hot summer day. Your guide will share with you the amazing history of the area, and show you examples of painted rock petroglyphs, before breaking to enjoy lunch. After lunch, you'll have free time to explore the canyon before returning to the ranch. Cruise Passengers: This tour is not recommended for cruise ship passengers due to its early departure from the marina. Daily from 7:00 AM to 5:00 PM. Complementary pickup from your Los Cabos hotel or residence. All ages welcome. Kids prices apply to ages 4-11 years old. Kids under 4 are free. This is a great way to get off the beaten track, and see the real Baja. Make sure to bring a swimsuit because especially in summer, it can be hot, and the pool below the waterfall will feel oh so good. Although open to all, this tour isn't really intended for small kids, or folks that are overweight or quite out of shape - keep these things in mind before booking this tour. It is an active tour, that involves some rock-hopping and uneven terrain. Don't forget your camera! This seldom-seen area offers many unique photographic opportunities.